Have you always wanted a straight, beautiful smile? You have considered braces in the past, but you do not want to draw more attention by adding brackets and wires. You are not out of options. Now, you can get the results you want with a nearly invisible solution. Dr. Farshad Bakhtyari will help you align your teeth and bite with Invisalign in Herndon. In as little as one year, you will have a flawless smile without using metal braces. Often, it is believed orthodontics is only for children. This is largely due to the juvenile appearance that brackets and wires create; however, you are never too old for a straight smile. Now, 1 in 5 orthodontic patients is over the age of 18. More adults than ever are choosing to align their teeth due to new treatment options, like Invisalign. 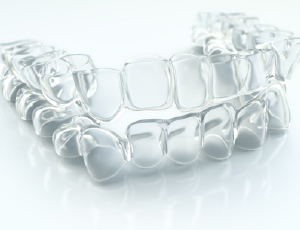 Instead of using brackets and wires to pull the teeth into position, clear aligners gradually move them. The FDA-approved system uses digital impressions of your mouth to create a roadmap to reposition them. This also allows you to see what your new smile will look like even before you commit to the treatment. Using the impressions, he designs a series of aligners, which you will wear for at least 22 hours per day. Each one is worn for 1 to 2 weeks depending on Dr. Bakhtyari’s advice. Your teeth will be repositioned as you progress through the series. On average, it takes about 12 months to finish the series. At the end of your treatment, you will briefly require a retainer to prevent your teeth from moving back into their previous positions. Smooth aligners provide added comfort and reduced irritation. Fewer appointments with your dentist because you do not need wire adjustments. Easy oral hygiene because there are no brackets and wires to clean around. Simple daily care for the aligners. No restrictions to your diet because Invisalign is removable. Confidence when speaking and smiling because the aligners offer a secure fit. Effective for correcting several bite and alignment issues. Choose the Clear Choice Today! You do not have to live with an imperfect smile. You can improve your confidence and your oral health by choosing Invisalign. Your cosmetic dentist in Herndon will create the customized treatment plan you need to benefit from the clear choice in orthodontics. Contact Premier Dental Care, PC today to see if Invisalign is right for you.